This stamp set is an adorable tiny set from Waffle Flower (this is one stamp). I embossed in brown, and colored the flowers to be Black Eyed Susans (the state flower of Maryland). Our weather has been so cold, it is not like I could send anyone sunshine (with warmth!) at this point. But, I thought the Black Eyed Susans might brighten up the day of someone longing for Maryland. The green background paper is and oldie-but-a-goodie from A Muse. I think it was called “Kitchen”, and came in a multicolor variety pack maybe 10 years ago. I still have some scraps in my folder. 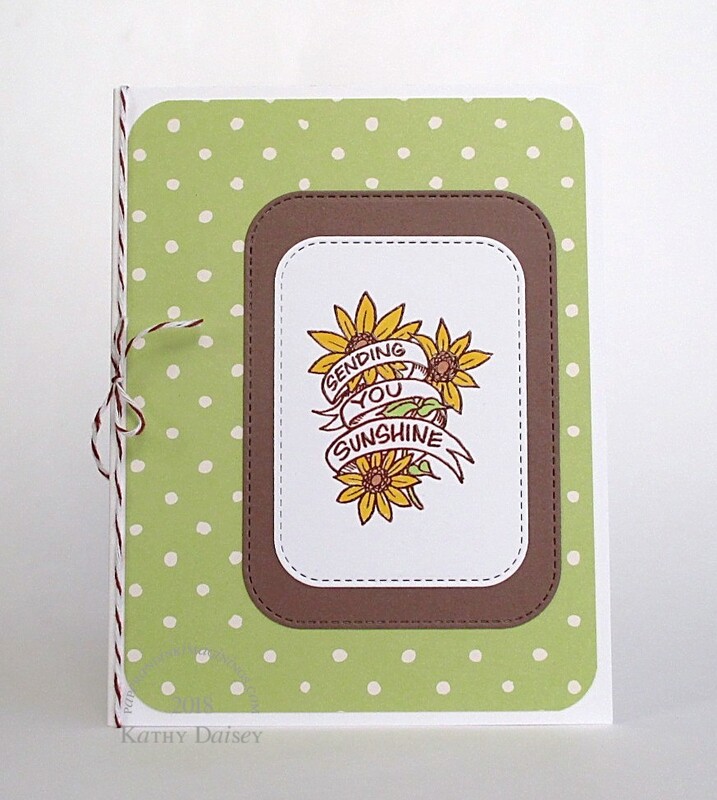 Supplies: Stamp – Waffle Flower, paper – A Muse, Neenah Classic Crest Solar White, Stampin’ Up! Close to Cocoa (retired), inks – Copic E23, YG03, Y18, VersaFine Vintage Sepia, dies – My Favorite Things, corner rounder – Stampin’ Up!, embossing powder – Filigree Fine Art Powder clear, twine – Martha Stewart. Categories: card, encouragement | Tags: A Muse Artstamps, card, Copics, My Favorite Things, Neenah, Stampin' Up!, Tsukineko, VersaFine, Waffle Flower | Permalink. Would you please set this aside for me? Yes, Terry, I have put it in the stash of cards for you (we are up to 8 cards). Thank you! I will e-mail you.